In a sense, we are all still hunter-Gatherers and, although we can’t replicate our natural habitat entirely, we can optimise our lives to fit into the modern constraints we face. We have more in common with our cave men ancestors than we do differences. Like it or not, our physiology hasn’t changed much since we were hunting and gathering. With the onset of both the Industrial and Digital revolutions, our daily lives look very different to even a few hundred years ago. There are many perks with the modern age – but there are also many downfalls. Our health problems may not be as visible or dramatic as plagues, pox and gangrene, but there’s ample data illustrating the negative impact that sedentarism has. It is not hard to predict that employers will become increasing under scrutiny as more and more research emphasises the need to combat a sedentary lifestyle and to maintain health. The focus will no doubt be on them to ensure that the workplace is offering solutions to combat sedentarism as it’s the place most people spend the majority of their lives. There are many times we can be more active and the choice to move is presented to us throughout our day - carrying shopping bags to the car instead of pushing the trolley, walking to a bus stop further away, taking the stairs. Bear in mind that exercise is a modern invention and we can gain a lot by adding a bit of activity into everything we do - small changes in behaviour are incredibly effective in the long run even if they feel insignificant compared to an hour at Crossfit. The little free time we have at home throughout the week can often become an excuse to relax passively in front of a screen and not do much of anything. However, we can make a few minimal changes and tweak our lifestyle to ensure that we’re incorporating more movement without sacrificing more of our free time. The goal of a workplace assessment it to increase happiness, health and satisfaction without impacting productivity. Sickness absence is a key indicator of how well an organisation is managed and work-related stress, anxiety or depression now accounts for over half of all working days lost to ill health. A positive workplace culture boosts productivity by up to 20%, reduces absenteeism, increases staff retention and job satisfaction - a win-win for everyone. Workplace wellness is critical to companies due to the huge cost implications related to employee illness and it’s important to re-think the way we work indoors as it has a significant impact on our health and wellbeing. Including these assessments as part of a broader Corporate Wellness strategy has signifcant benefits for both the company and its employees. 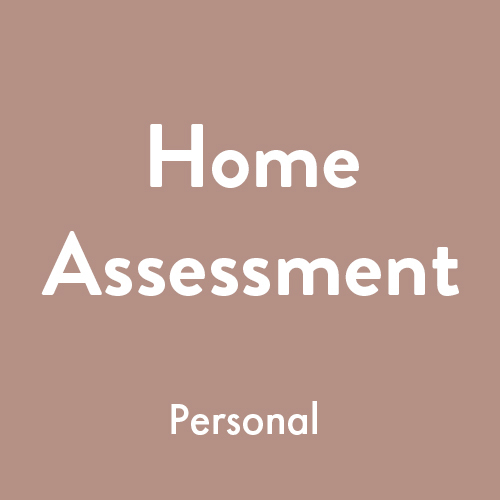 The goal of a home assessment is to analyse how you use your space and offer simple and achievable tools to enable you to minimise the effects of indoor living and create more movement opportunities as you go about your normal routine. Whether you’re in rented accommodation and can only make superficial changes or you’re wanting to remodel your home, there are many ways to combat the effects of an indoor lifestyle that suit your situation and budget. We now spend up to 90% of our time indoors and indoor air quality is up to 5 times more polluted than outdoor levels. Everyday home life activities, such as cooking, cleaning, showering, and breathing all contribute to this, with children’s bedrooms often the most polluted.